Having picked up DJ Mag’s ‘Best Compilation Album Of The Year’ Award for the first part of the ‘Way Of The Warrior’ album series in 2011, in celebration of 50 Shogun Audio releases, the label returns with part two of their label showcase. 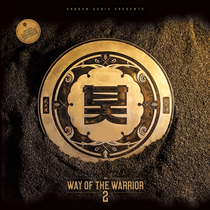 The compilation brings a selection of some of the finest D&B music created by their entourage of Shogun Audio artists and features future bass technology from Shogun’s inner and outer circles including Friction & K-Tee, Rockwell, Icicle, Technimatic and Spectrasoul, alongside contributions from new signings Joe Ford and Fourward. It’s out now, check the tracklisting below.